Of you I'll never tire. Copyright © 2006 Kenn Nesbitt. All Rights Reserved. Reprinted by permission of the author. Uni-Saders hanging out in the staging are before a parade in Dripping Springs, Texas. Most of us remember well the sense of joy and accomplishment we experienced when we first mastered the "art" of riding a bicycle. Many of us will also remember the sense of pride we felt when our 6-year-old was able to ride his or her bicycle for the first time, without those training wheels. But how many of us have tried to ride a unicycle? You know, one of those contraptions with only one wheel, "so impossible to ride." I do not remember how the subject of unicycles came up during one of our regular coffee klatches with a friend a while ago. 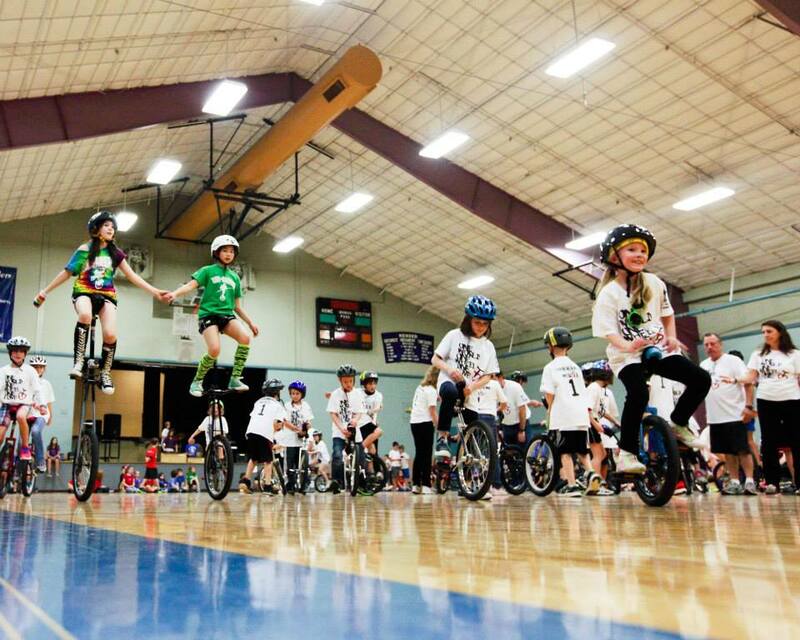 Something about a bunch of kids riding around, perched on unicycles. Recently, it came up again and, pursuing the subject a little more, I discovered how a colleague of my friend has truly made unicycles, as Ken Nesbitt's poem says, "beautiful and kind, like the petals on a flower." The unicycles my friend, Dwight Bawcom, was talking about are not necessarily beautiful in appearance -- many of them are well used, some have scratches and dents. But they are beautiful, "like the petals on a flower," because of how these "contraptions" are helping young children overcome, achieve and excel. You see, my friend's colleague, Jimmy Agnew, uses unicycles to inspire children "to grow physically, mentally, emotionally, and socially." It all started eight years ago when Agnew, a teacher at St. Andrew's Episcopal School in Austin, Texas, and his second graders began gathering unicycles from Craigslist and neighborhood garage sales and started meeting in the school's small gym every Friday after school. There, according to Agnew, the children "would laugh, and play, and celebrate their failures as they consistently fell over and over again" trying to ride those unicycles. Agnew continues, "Only with perseverance, determination, and constant encouragement from their peers, did they eventually, one by one, learn to ride." It soon became obvious to Agnew -- a former college basketball player -- that what the second graders were doing was much more than just learning to ride a unicycle. They were overcoming self-doubt and replacing it with self-confidence. They were gaining self-esteem, inspiring themselves and each other, learning and displaying patience, trust, courage and especially perseverance: "It's about getting them used to failing but then working through it," Agnew says in an interview. Dr. W. Eric Grossman, an associate professor of education at Emory & Henry College, Virginia, puts Agnew's "failing but then working through it" in a slightly different way. He refers to attempting to ride a unicycle as "an unnatural, difficult, and complex skill" where one has to -- taking from Samuel Beckett -- "Try again. Fail again. Fail better." Riding a unicycle is physically striking. 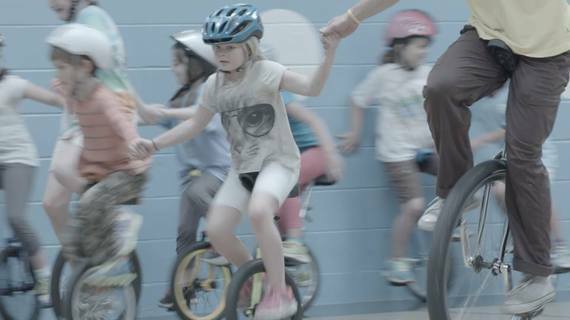 When kids finally reach the point of wheeling out of the schoolyard on their unicycle, they will have also achieved at least two additional goals: they will have a captivating means to stay active and fit and they will know what is required to learn something difficult. Eight years after Agnew founded his modest yet trailblazing program -- today called "One Wheel Many Children"-- more than 700 children have "wheeled out of the school yard on their unicycle." Agnew's original after-school program has now been replicated at other schools in Austin and San Antonio, Texas, and is currently being launched at Austin's Comunidad School, one of our nation's 200 KIPP (Knowledge is Power Program) public charter schools, as part of a formal, play-based literacy curriculum. 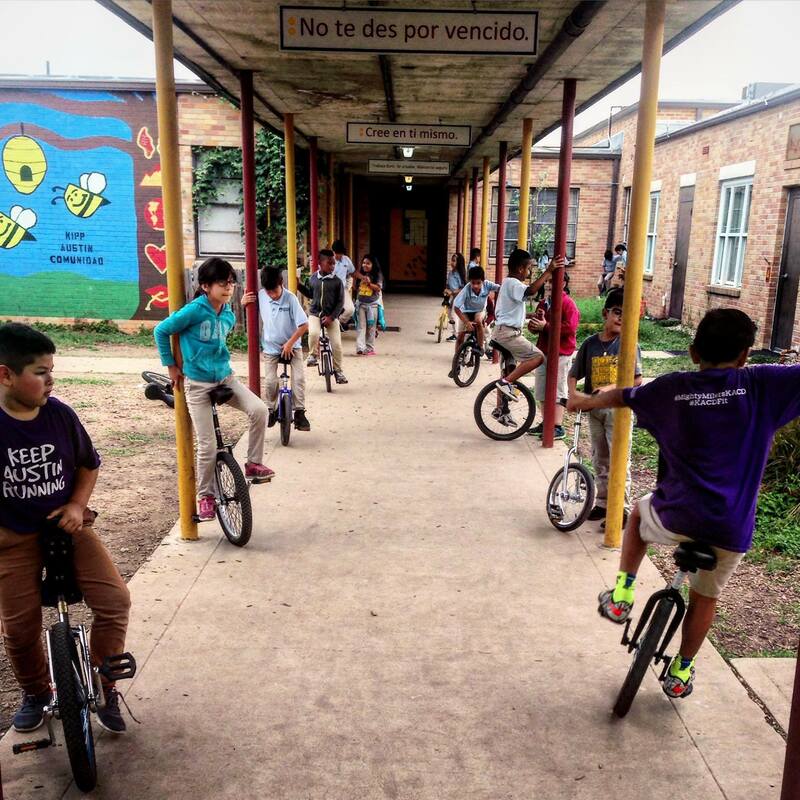 Third Graders at KIPP Austin Comunidad learning to unicycle along their Empowerment Path. Through child-driven literacy, we aim to create a forum for children to share their voice and launch additional school unicycle clubs. Essentially empowering through play to develop a growth mindset. 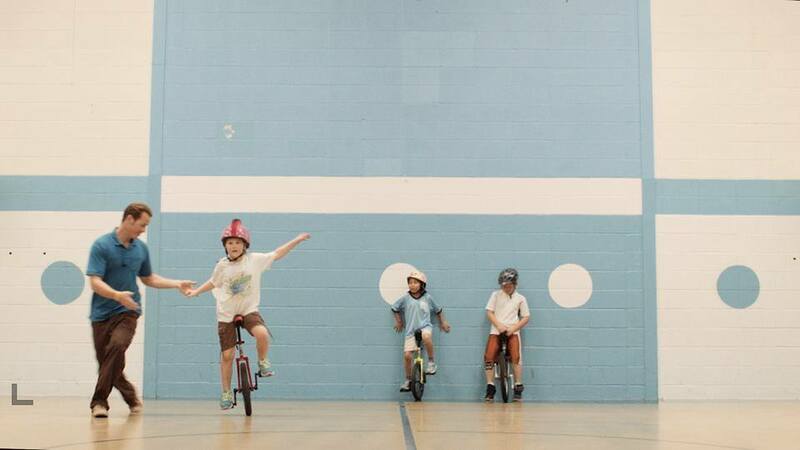 The unicycle is an ideal childhood development tool and our goal is to use that tool to empower communities and develop such mindsets. The unicycle was invented more than 100 years ago. It was born out of the "Penny Farthing" bicycle, named after the English penny (the giant front wheel) and the farthing (the miniature rear wheel). It wasn't long before some people realized they really didn't need that back wheel of the penny farthing. First the back wheel was removed, then the handles too...and pretty soon the unicycle was born. A curiosity, a challenge, popular among circus clown and acrobatic performers, the unicycle started seeing widespread popularity in the 1980s, "when new unicycle variations created an entirely new generation of riders." A little more than three decades later, another generation of riders are taming those contraptions: Agnew's young Uni-Saders who are learning, among other things, "support, patience, trust and courage" thanks to dedicated and visionary people such as Agnew and generous volunteers such as my friend Dwight. The words "support, patience, trust" are written in each spoke of unicycle drawings by third graders, displayed at one school in Austin, Texas, reflecting what these young Uni-Saders believe they are learning from conquering those unicycles, "impossible to ride." A young Uni-Sader expresses similar feelings in a "daily reflection sheet" at KIPP Austin Comunidad, below. Words only begin to describe the joy, challenges and frustration experienced by Uni-Saders as they learn to "unicycle," and grow. Please watch the video below and also view the story of one youngster who conquered the unicycle and achieved much more here. 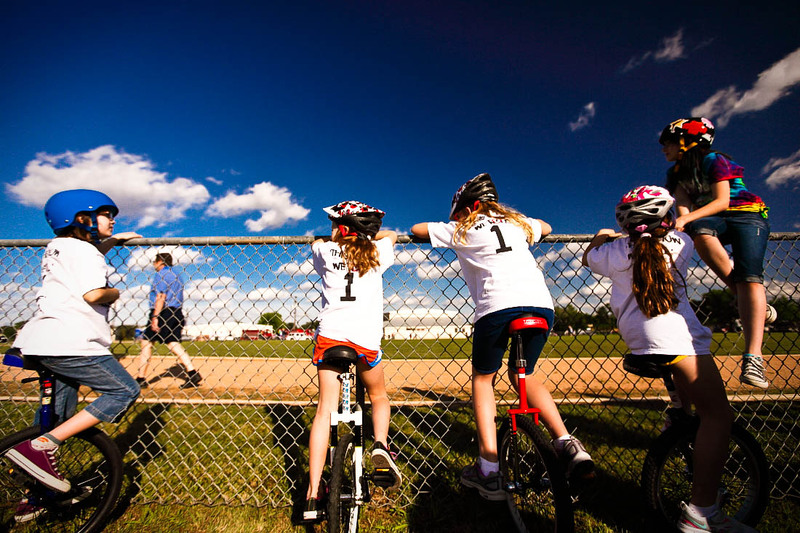 Also, visit the One Wheel Many Children site to learn more about this unique project and to perhaps contribute to this commendable non-profit organization. Lead photo: Uni-Saders enjoying "life's ride" in the small gym of St. Andrew's Episcopal School of Austin, TX.